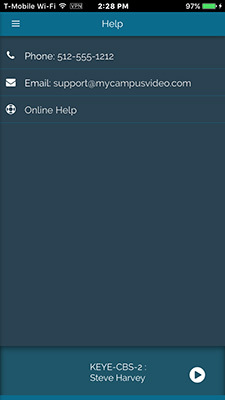 From the Stream2 Main Menu, the Help menu provides a phone number, email address and a link to Stream2 online help. The Online Help opens in Safari. Users can return to Stream2 from Help by tapping on the 'Back' button in your browser. 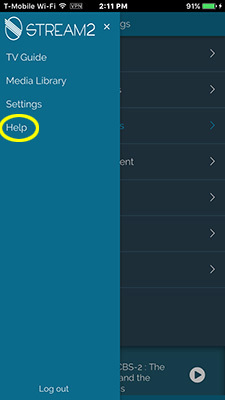 Selecting this option displays the phone number for the Apogee Support desk, a link to email Technical support, and a link to Stream2 online help. 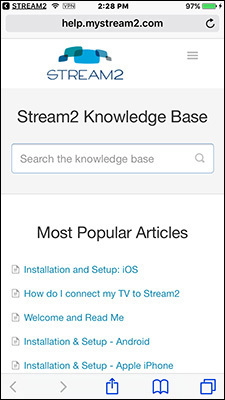 The Stream2 online Help resource is hosted separately, outside of the Stream2 app. It contains these instructional Web pages and technical support information. It opens in the default browser of the device that is running the Stream2 app.